Relapsing remitting multiple sclerosis (RRMS) treatment Plegridy (peg interferon beta-1a) by Biogen Idec, has just received Welsh NHS approval, which should make it available to patients by late October 2015. The decision follows NHS Scotland’s approval earlier this year, however, the biweekly interferon beta shot has yet to be made available in England’s NICE healthcare system. Plegridy was approved across several countries in the European Union in July of 2014. “The approval of Plegridy in Wales is good news for people with MS who experience relapses. It gives them a wider choice of treatment with the option to inject less frequently. Choosing which disease modifying drug is best for you is an important decision which should be made in partnership with your neurologist and MS specialist nurse,” said Amy Bowen, the Director of Service Development at MS Trust. The novel treatment was formulated by incorporating polyethylene glycol to interferon beta 1a, allowing the drug to remain in the body for a much longer time. The therapy is administered only once every two weeks, making it a significantly more convenient option for patients living with the life-long disease. 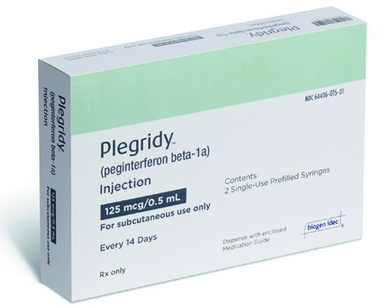 Previously completed clinical studies demonstrated Plegridy as an equivalent to interferon beta 1a, as it has the ability to reduce RRMS relapse rates by about a third, compared to placebo. Common side effects are minimal, and include minor inflammation or discomfort at the site of injection. Oral fingolimod (0.5 mg, once-daily) is an efficient therapy for relapsing forms of MS. Previous studies have suggested that fingolimod has a beneficial effect in terms of relapses in patients who discontinued natalizumab treatment, and could therefore be considered a potential suitable switch therapy from natalizumab.